The road sign indicates left to Lulworth Cove and right for Durdle Door Camp. 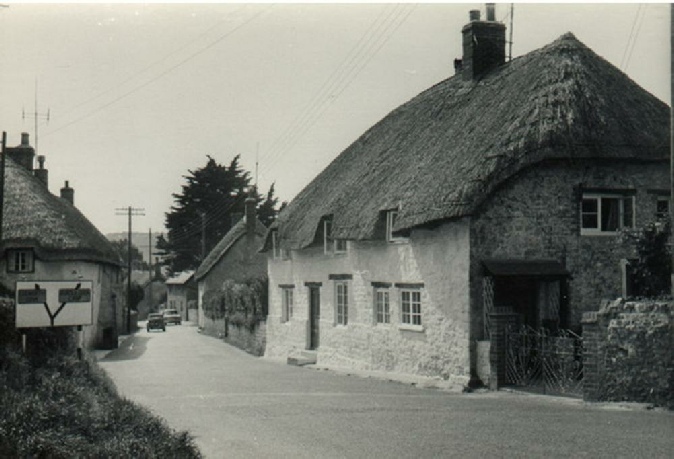 The site of the old church was to the left of the cottage in the centre of the picture - the churchyard wall was in line with the walls of the cottages either side. In 1975, the churchyard wall was removed, some graves were excavated to make way for a pavement and a new churchyard wall was built further back. The excavated remains were re-interred at the new churchyard.